Hamaguchi Apps for Speech, Language & Auditory Development's groundbreaking iPad app is designed for older elementary through high school students, who would benefit from practice interpreting vocal intonation, facial expressions, perspective-taking, body language, and idiomatic or slang expressions. 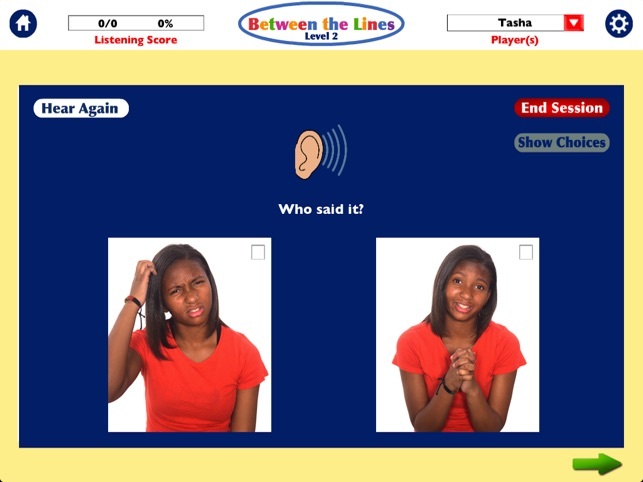 Using real photographs, voices and short mini-video clips of a variety of social situations and expressions, this app provides a dynamic way to help learn and practice interpreting messages that are “between the lines” and simply can’t be replicated with worksheets and static flashcards. Scenes in the Body Language activity feature interactions that take place in the following settings: restaurant, school, park, bedroom, birthday party, in front of a school, mall, family room, kitchen, dining room, and fitness center. 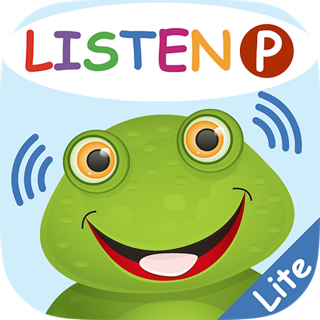 This app uses American expressions and body language. 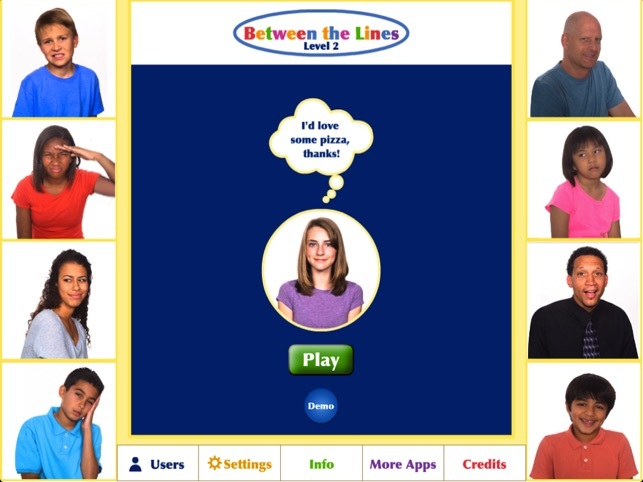 It is a companion app to our Between the Lines Level 1-containing the same 3 activities, with different content for continued learning. Most of the activities are about the same level of difficulty, but some are slightly more challenging. 1. 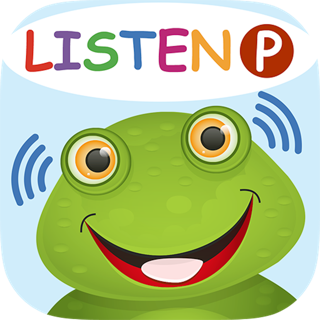 Listening: The user hears a voice speak a sentence, e.g., “I got an A on my Spelling test! ” A question is then asked, “Who said it?” The user is shown a series of photographs. Depending upon the settings selected, there can be 2, 3 or 4 choices shown. The user touches the correct facial expression that matches the voice. 2. Body Language: A very short video-clip is shown that depicts an interaction or situation. For example, a teenager asks her mother, “Mom—so is it ok if I sleepover Briana’s tonight?” Her mother responds with, “Is her mother going to be home?” The teen looks away and hesitates, “Uh..yeah…yeah.” The camera closes in and we can see she is most likely lying. 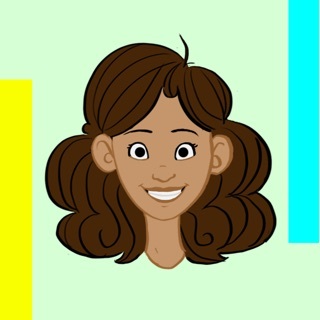 The narrator asks, “What is she thinking?” The user’s task is to look at the choices of responses and select the one that matches the facial expression/body language. The game can be played by up to 75 users or as a group. 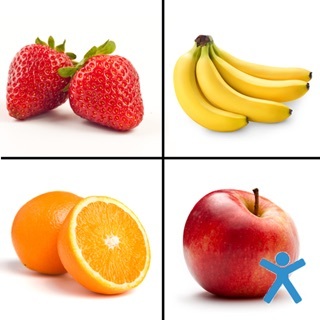 The percentage correct is reported for each user’s performance on each of the three activities. Settings include: Selection of the activities, order of the activities (or random), praise phrases and correct sound effect bell on/off; answer choices (group of 2, 3 or 4), how to display choices (automatically or manually) and whether to move forward automatically or by touching an arrow. Progress can be tracked, and displayed or not displayed. Reward animations are provided at selected intervals for a welcome fun and break including Dunk Tank, Bull’s Eye (darts), and Knock ‘Em Down. These are not games of skill, but a fun diversion. Data can be printed, saved or emailed. I purchased levels 1 & 2. I am using these with kids at school and in private therapy. Love the videos and pictures! 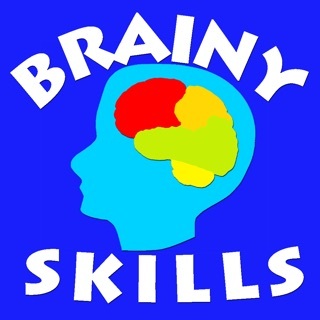 It is proving to be very successful and targets the skills my kids need. Very engaging for students! Love the animation, real-life scenes, and presentations for my elementary students. One question: is there is way to de-select a scene which comes across as insensitive to a family's culture? Thanks in advance! Even though it's been over 4 years since you posted this review, we wanted to respond to the review, now that Apple is allowing developers to do so. First of all, thanks for the kind words about the app. 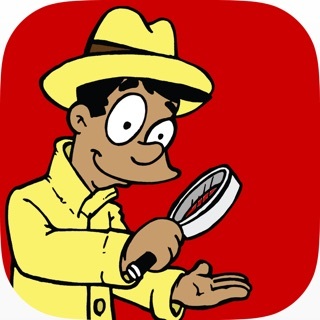 We hope it is still a useful app for the children you work with! In response to your question, there is no way to specifically de-select a scene, but we did move a number of potentially offensive scenes to a special section which now have to be directly added in order to be used. Hopefully this fixed the issue for you.